Are you experiencing a loss of mobility? Perhaps you have a parent whose independence is at risk because they can’t get up without assistance. One possibility to consider is adding a lift chair to the home. The time to consider a lift chair is when someone may need help getting in and out of their chair on a daily basis whether due to aging or a recent surgery that limits their mobility. Lift chairs feel and look like regular chairs but they have mechanisms that allow the chair to raise and lower in order to easily stand up or sit down. Typically, those in need of a standard lift chair are not able to get in and out of a chair by themselves, yet are able to move around on their own, with or without the assistance of a walker. Lift chairs offer all the comfort of a traditional recliner with key differences. They come with a strong motor located in the base of the chair. A lift chair looks much like a traditional armchair recliner in many cases. A handheld control accompanies the chair to control the motor that gently lifts the chair and its occupant up and back from the seated to the standing position. Other positions may be desired including a flat recline which allows for sleep. Many additional features are available both in design and functionality. Pace Medical carries a large selection of a Golden Technologies lift chairs featuring customized comfort settings and the quietest and securest lifting system. For more lift chairs that are stylish, comfortable and reliable, browse Pace’s selection of Pride power lift chairs. Our online brochures explain all the main features, or you can even customize your own. Lift chairs provide a multitude of benefits to many seniors. At a time in life when independence seems less and less possible to maintain, these devices offer solutions. They are typically more spacious than recliner chairs and can even be used for sleeping when in a reclining position. Along with the assistance in getting up and down these chairs reduce the risk of further injury. Caregivers benefit from lift chairs as well. Helping an adult transition from a sitting (or even lying) position imposes a physical strain on the caregiver, potentially resulting in a challenging and dangerous situation for both the caregiver and the adult. Lift chairs reduce the need for monitoring the safety of a loved one as they move about their home more freely. Selecting the right lift chair is an important process. With many models and options available it’s a good approach to look at the needs of the primary user, focusing on their weight, height, and the amount of time they expect to spend in the chair. How the chair will be used should be considered – for sitting, reading, watching television, napping, or even sleeping. A lift chair becomes part of the home décor and so there are considerations beyond functionality and price. There are space requirements, fabrics and colors to consider. Visit Pace Medical Equipment & Supplies and let our family assist you. We can discuss insurance and warranty information. 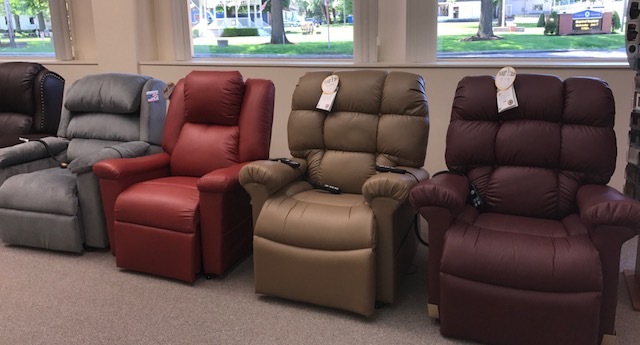 We’re a family owned business who has been serving Northeast Ohio since 2003 and we offer one of the largest selections of lift chairs available. A quality lift chair will provide years of use and enjoyment in a home and serve it’s users with safety and convenience.